On you our hopes we fix. The National Anthem’s lesser-known verses now appear somewhat awkward and the edited verse now becomes a call to arms aimed at an unknown subject rallying against an unknown enemy. In the current political and cultural climate of fear, these sentiments aptly evoke the everyday paranoia and trend towards the need to locate an enemy on whom to focus and apportion blame. The final line ‘On you our hopes we fix’ highlights the futility of the statement. Without a clearly defined enemy the acts of scattering, confounding, and confusing become aimless and perhaps random. 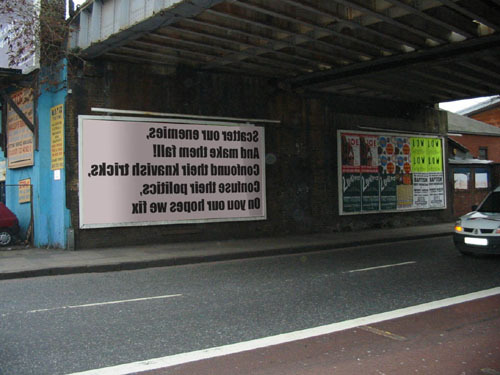 The text is presented in mirrored image, placing the viewer in an imagined space behind the surface on which the text sits, like Alice gazing back through the looking glass. This mirroring highlights the interface where information is presented, the fragile surface that separates the real and virtual worlds that seem to fuel our insecurities.